Get a Peace Lily and not sure how to care for it? 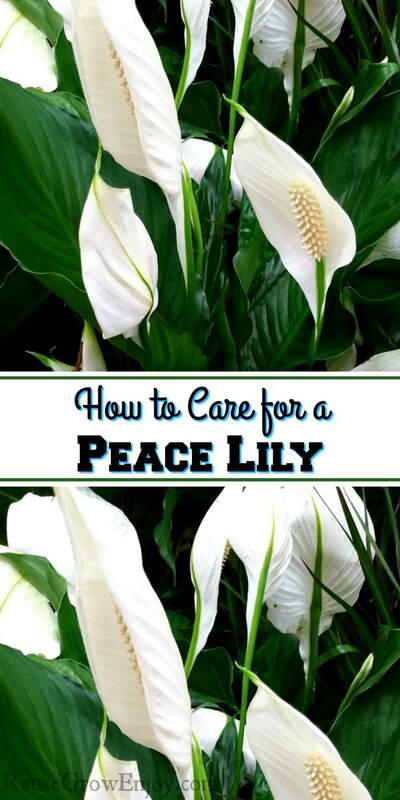 This post is full of 5+ tips How to Care for a Peace Lily Plant. You should find everything you need to have happy healthy plants. 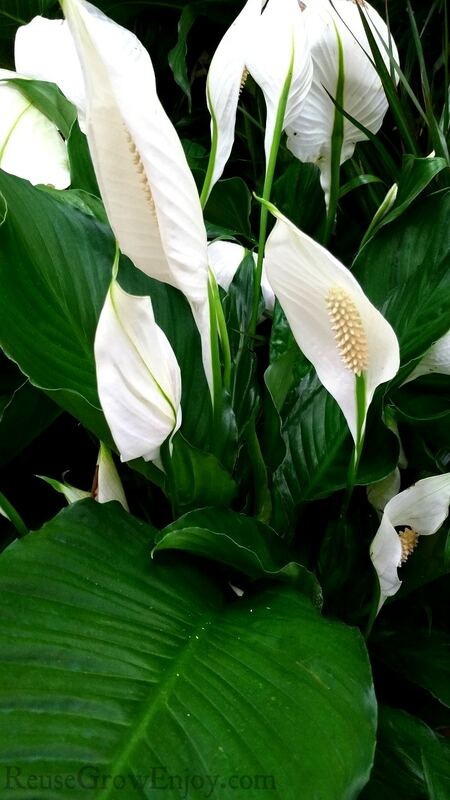 If you’re trying to find the perfect houseplant for your home, look no further than the peace lily! Not only do they look wonderful and come in a variety of different sizes, but they’re also amazingly easy to care for! Just learn these tips on How to Care for a Peace Lily plant and your lily will flourish for years to come! Peace lilies thrive under indirect light. That doesn’t mean low light, it just means that they prefer not to be pressed right against your brightest window. But anywhere else in a decently lit room is likely to be a good place for your peace lily. In fact, peace lilies can even thrive in a room with only fluorescent lights as their light source! The number one thing you need to learn about how to care for a peace lily is how to water them. Peace lilies’ soil should be kept moist, but if you find yourself having to water them all the time, that means they need different soil and/or a different pot. Ideally, your peace lily should be planted in soil that drains well and in a decently large enough container that the soil can hold water for a couple of days. Watering once a week is usually enough with good soil and a proper pot. Peace lilies like fertilizer, but not all the time. In general, wait a month and a half after fertilizing before fertilizing again. A liquid 20-20-20 fertilizer works well. If your peace lily is being kept in an area without a lot of light (and as a result is growing slowly), you only need to fertilize every 3 months. If you’re not that into fertilizing but still want to make sure you get great peace lily flowers, at least fertilize your plant during the spring and summer. Peace lilies prefer to be at average room temperatures, which is great because that’s usually the temperature your house is at! However, if you want to best care for a peace lily you need to make sure not to place your lily near anything that will make it hotter. Such as a heater, fireplace, or oven or by anything that will make it cold, like a drafty door or window. Also, avoid placing your plant by any cold supply vents. Lastly, to perfectly care for a peace lily, you should recreate the humidity of its native tropical environment. You can easily do this by putting a humidifier in the same room, or by just misting the plant’s leaves every so often. You may also want to get several peace lilies or other high-humidity plants and pot them all together. Group potting like this creates a miniature sort of rainforest environment. That helps all the plants better maintain their moisture levels. So as you can see, peace lilies make wonderfully low-maintenance houseplants! If you take good care of your plant, it could live 5 years, or more (though 3-5 is the average). If you have pets, remember to keep them away from your peace lily. While the peace lily is not the Easter lily, eating a peace lily can still make your pet very sick. Luckily most pets won’t really eat a peace lily as the plant irritates their mouth right away. So they usually stop. But still, some pets are stubborn and will keep at it anyway, so it’s better to be safe than sorry. Interestingly enough, the oxalates that can make your pet sick can also irritate your skin. When you handle the plant (like while you’re repotting it). So wear gardening gloves while dealing with your lily, and if it does irritate your skin, wash the area with soap and water. Have you ever cared for an indoor lily before? If you found this helpful, here are a few other posts to check out. Can you put a Peace Lily outside during the summer? It depends on the area you are in. They can be put outdoors in the summer if you are not in a super dry area. However, with doing so there are a few things to watch out for. You will need to make sure you check the soil more often as it can dry out faster outdoors. You will also want to make sure not to put them in super hot direct sunlight. They can take a little direct sun in the mornings or evenings when it is cooler but the hottest part of the day the direct sun will burn them. I have had mine for a year. It has beautiful foliage, but no flowers . What am I doing wrong ? Sorry to hear that Verna. Are you following the tips in this post for lighting, soil, watering and fertilizing? Also if you got it as a super small plant it can take a year or a little longer before you see the first bloom. They like to bloom spring or early summer so if you are giving it what it needs then you should be seeing blooms soon. Hi, I just received a huge piece plant peace Lily from a lady who had it for a year (her husband died and she received it at the funeral). Can I expect it to only live a little while? Also, the leaves have a little brown edge on them. Is there anything I can do to help that? Hi Susan, peace lily plants are such a pretty plant and I really think you are going to enjoy it. If taken care of right they can live for a long time. As for the brown edges on the leaves, it can come from a few different things. It could have been put right in direct sunlight outdoors, over fertilizing, not properly watering, pests and so on. If you take care of it using these tips on how to care for a peace lily plant it should stop the browning on the edges. It may not repair the already brown areas, but just keep it from getting any worse. Hi, I commented to you about that huge piece plant that I received. Another question: can I separated into different plants or will it just die if I do that? Yes, a peace lily plant can be divided. To do so, you just want to carefully remove it from the pot. Then try and find small areas where it looks like the foliage is attaching to root sections and pull them apart trying to do as little damage as you can. If the plant has a large root ball is really root bound (roots really tangled together wrapping around the dirt edge) you may need to use a knife to help cut the roots. After you have them apart, plant each one in a new pot that is big enough to allow it to grow a little. It may take on a little plant shock, but with care, it will bounce right back. Hope that helps! Happy gardening! Should the Peace lilly be pruned of damaged or brown leaves? Hi Donna, yes when you have leaves that become damaged or brown they should be pruned so as not to take energy from the plant. If you notice them happening often, it may be time to repot or even divide the plant as it may be from overcrowding in the pot.